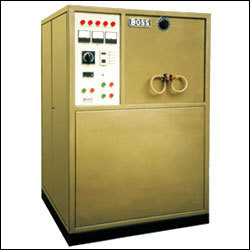 We put forth for our clients an impeccable range of Radio Frequency Induction Heaters. In this above named range we are offering Radio Frequency Induction Heater. The offered induction heaters are developed by using high quality raw material and other components, sourced from the vendors of high prestige while keeping in mind the prevailing trends of the industry. Offered induction possess various attributes like total fault condition on panel, grid current control and quick change of coil. We have in store a wide array of Radio Frequency Induction Heater, which is ideal for precise heating of electrically conductive material like steel and other metals at predetermined areas. Patron across the nation appreciate the offered induction heaters as these operate via coil, which produces an alternating magnetic field wherein the movement of electrons produces heat. Our patrons can avail from us these induction heaters as per their given specifications.